Messerschmitt Bf 109 D-1 "Special"
Flown by the Journalist Tintin, from Borduria to Klow, the capital of Syldavia. However on rout he is shot down by Syldavian Flak. Since childhood I have been fascinated by the Belgian cartoonist Hergé (Georges Remi) especially for his eye for details and his style resemblance old Japanese drawings. This aircraft drawing is my homage to Hergés work. Background: In one of the volumes of the Adventures of Tintin, King Ottokar's Sceptre (Le Sceptre d'Ottokar) the young Belgian reporter Tintin and his dog Snowy (Milou), travels to the fictional Balkan nations of Syldavia and Borduria. Here Tintin combat a plot to overthrow the monarchy of Syldavia. 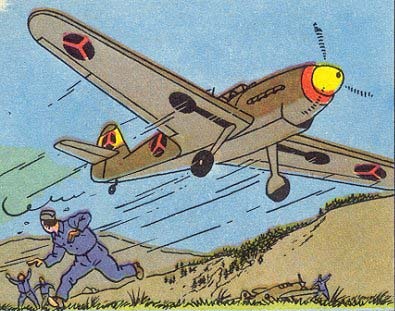 The aggressive nation Borduria is a satirical depiction of Nazi Germany and in the first edition, published in 1939 Tintin manage to escapes Borduria in a Heinkel He 112(or is it a He 118? ), while in the revised version, published in 1947 this is replaced by a Messerschmitt Bf 109. More aircrafts form Adventures of Tintin would follow!